A deep, rewarding seafaring RPG. What is it? A nautical RPG with an emphasis on story and freedom. Back in 2015, with the help of about 70,000 Kickstarter backers, Obsidian took the best parts of beloved CRPGs such as Baldur’s Gate and Planescape: Torment—deep combat, rich dialogue, reactive stories—and built one of the best modern RPGs on PC. Pillars of Eternity plundered the best of the genre, but also made its own mark with a setting so well-realised and dense with lore it felt like it could have been based on some forgotten series of grand fantasy novels. And now Obsidian is taking us to another corner of that fantastic world: the dangerous and exotic Deadfire Archipelago, a chain of islands far to the east of the relatively green and pleasant Dyrwood. You are the Watcher, a hero who is either, depending on who you ask, cursed or blessed with the ability to peer into the souls of the dead and talk to them. After the events of the first game you’ve decided to hang your sword and shield up and settle down in the fortress of Caed Nua. But then a giant crystal colossus buried under the castle is possessed by the god Eothas, bursts out of the ground, destroys your home, and leaves you for dead. You survive, of course, thanks to the intervention of a sinister benefactor, and learn that the giant has been spotted stomping across the Deadfire Archipelago. And so you give chase aboard your ship, the Defiant, which dramatically sets the wheels of the plot in motion. If you didn’t play the first Pillars of Eternity, that’s totally fine. Deadfire not only neatly and succinctly summarises the events of the original game in the intro, but gives you the chance to create a history for your character, essentially simulating an imported save. The sheer number of choices and decisions you can make is daunting, however, which is where Obsidian’s selection of pre-made histories might come in handy. These let you quickly decide whether your character was benevolent, tyrannical, or something inbetween. There’s even one history that supposes you got every companion killed and the worst outcome of every quest. And you’ll know when your history, whether it was created or imported from an old save, affects something in the new game by a symbol that appears next to certain lines of dialogue. If you’ve played a CRPG before, the fundamentals will be immediately familiar. You move around by pointing and clicking around an isometric map, talking to folk, fighting monsters, and looting dungeons. There are towns and cities and temples and jungles, all stuffed with long, twisting quests, interesting characters, and tough moral quandaries to wrestle with. You’ll be swept up in the lives of the people you meet around the Deadfire, from pirates and priests to smugglers and queens. You’ll level up, unlock new abilities and spells, recruit new party members, and find magical items with evocative descriptions. It’s the stuff of dreams for anyone who loves those old Infinity Engine RPGs, although the number of similar games released since Pillars made its debut, be it Divinity 2, Tyranny, or Tides of Numenera, does blunt the nostalgic edge somewhat. But what makes this sequel different from other CRPGs that have come before it is the focus on seafaring. Travelling between islands in the Deadfire, which is impossibly big, requires a ship. And to run a ship you need a crew, which is where the nautical management aspect of the game comes in. As you sail around the world map, your crew—who can be hired from taverns or met while adventuring—will drain your food and water resources. And the quality of what you provide them will affect their morale and performance in battle. Give them water and hardtack, a miserable long-lasting biscuit notorious in the Age of Sail, and you might have a mutiny on your hands. But ply them with rum and fresh fruit (which is much more expensive, naturally) and they’ll love you. There are other issues to deal with, including injuries, pirates, and drama such as fights and arguments breaking out among the crew. This adds a nice layer of interaction and roleplaying to journeying between locations, which is normally quite uneventful in these games bar a few bandit ambushes. The problem is that the actual act of sailing isn’t very compelling. You move around the disappointingly static world map simply by clicking, and I never really bought into the illusion that I was at the helm of a ship battling the elements. Keeping the galley stocked and the crew happy soon becomes a routine, and leaves the nautical portions of the game feeling a bit gimmicky. Ship combat is more successful. It’s turn-based and takes place on a separate screen with a dedicated interface. A circle shows you which way your ship is facing relative to the enemy, and you command your crew by selecting actions from a menu. You can use a turn to reposition your ship, speed up to get closer to the enemy, slow down to create some distance, or fire your weapons. Your cannons are only effective at specific ranges, which makes positioning vitally important. An illustration showing the enemy ship, its distance, and its current level of damage is an at-a-glance way to see how the battle is going. Your crew can get injured during ship combat, and losing someone important like a helmsman or surgeon to cannon fire can limit your effectiveness in battle. The Defiant can be heavily customised to make surviving these encounters more likely, with faster sails, a stronger hull, and more powerful cannons among the upgrades you can buy. Or you can buy a whole new ship altogether if you have a few thousand coppers to spare, but a bigger ship means more crew, more food, more booze, and more wages, so it’s a purchase you should save until you have more money to invest. If trading cannon balls from afar isn’t your thing, however, you can always charge the enemy at full speed and board their ship. Here the game switches to the familiar isometric view and you fight the crew using regular combat, leaping across to their deck like a classic Hollywood swashbuckler. When you defeat a ship your crew gets a big morale boost, and you can salvage supplies from the wreckage, choosing whether to share the money with the crew or keep it all to yourself. Dock the Defiant at one of the many islands littering the archipelago and the wind really hits Deadfire’s sails. When the game slips back into its comfy old roleplaying boots it’s among Obsidian’s finest work as RPG developers. The Dyrwood was a wonderfully drawn setting, dripping with culture and history, but the Deadfire Archipelago is even more fascinating and alien. There’s a whole world to discover out there: of strange rites and rituals, water-shaping priests, ancient sea dragons, and centuries of conquest and division. And I loved drinking it all in through long conversations, books, and inscriptions, eager to learn as much as I could about the history of this absurdly rich setting. Although, admittedly, the vast quantities of lore being constantly hurled at you can be a little overwhelming at times, especially if this is your first trip to Eora. The Deadfire is a wilder, more lawless place than the leafy Dyrwood, scattered with uncharted islands untouched by civilisation and pirates stalking the waterways. But you arrive there in a period of change, with foreign factions encroaching on the archipelago, looking to exploit it. Like some of the best fantasy, Pillars mirrors our own history, and it’s clear the turmoil in the Deadfire is an analogue of the colonisation of the Pacific. Factions include the native Huana, whose way of life and culture is being threatened by the arrival of groups like the Vailian Trading Company. And as the Watcher, you can decide whose side you’re on—if you want to pick a side at all. The Deadfire isn’t all remote villages and trading outposts. Neketaka, its largest city, is the game’s equivalent of Athkatla from Baldur’s Gate II or Torment’s Sigil: a massive, varied urban sprawl split into unique districts and brimming with quests, conversations, and distractions. It’s also the finest showcase of Obsidian’s beautiful, lavish background art, with intricate architecture reflecting the culture and customs of the region. Incidentally, Deadfire is a much prettier game that the original, with vastly improved 3D character models and real-time lighting that makes its environments feel much more dynamic and alive. It still has that distinctive Infinity Engine aesthetic, but everything just feels more solid and refined. While your main goal is hunting Eothas, Deadfire isn’t afraid to set you free and let you carve your own path through the archipelago. When the prologue is over you can sail pretty much anywhere, and there’s a lot to find out there, including a seemingly never-ending parade of quests. Tens of hours in, my quest log was overflowing with tasks. It’s a game where you’ll talk to some random NPC loitering in the corner of a tavern, and the next thing you know you’re fighting a sinister cult in the belly of an ancient, sunken pyramid on a remote desert island. There are plenty of quests with lower stakes too, including helping a theatre director cast a play and finding a way to make a suffering pirate puke up a gemstone he swallowed in a moment of panic. The variety is impressive and you’re never, ever short of things to do, both grand and menial. And with questing, inevitably, comes fighting. Deadfire uses a classic real-time-with-pause combat system, and how involved you are is up to you. You can turn party AI on and let the computer decide which spells and skills your party members use. Or you can take control of them individually, with granular control over everything they do. On harder difficulty settings the latter tactic is essential. This is a tough game and you’ll need to make use of your party’s huge array of buffs, debuffs, spells, and attacks to survive encounters with powerful enemies. But if you’re only here for the story, you can knock the difficulty down and breeze through most battles with a single click. This freedom to customise your experience is very much in the spirit of the CRPG, and you can even change the difficulty on the fly if you need a break or want more of a challenge. The customisation options don’t end there. You can fine-tune how the auto-pause works, selecting which events will trigger it—from the start of a fight to encountering a trap, which is handy for avoiding accidental stumbles into tripwires and mines. You can increase the loot radius so you spend less time plundering dead enemies and choose from six different interface layouts. 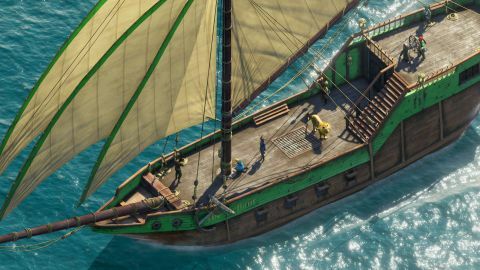 Obsidian’s dedication to making sure you have exactly the experience you want is an admirable quality, and Deadfire is perhaps the most effective realisation of that goal to date. And masochists will be glad to hear that Path of the Damned returns, an extreme difficulty mode with smarter, more aggressive enemies thrown at you in great swathes. As well as returning characters including easygoing soldier-turned-farmer Edér, dutiful elven wizard Aloth, and godlike paladin Pallegina, there are some new faces to adventure with in Deadfire. Maia Rua is an aumaua ranger accompanied by a red-streaked bird of prey named Ishiza, and she’s a mean shot with a rifle. Xoti is a priest who worships Gaun, an aspect of Eothas, and uses a strange, magical lantern to capture aimless souls. Tekēhu is a marine godlike chanter. And Serafen is a wry, wise orlan sailor loyal to a pirate faction called the Príncipi Sen Patrena, and my favourite of the lot. They’re an interesting bunch, and watching their relationships develop over time, both with the Watcher and each other, is entertaining. And yes, you can now romance certain party members if that floats your galleon. You also have to consider the personalities of your companions, who will react positively or negatively to certain actions. Xoti, for example, might not look kindly upon you showing any anti-religious sentiment. And if you do something that harms the Príncipi Sen Patrena, Serafen won’t be pleased. You can keep track of what each person thinks of you on your character sheet, as well as your disposition, which is shaped through the way you talk to people and handle situations. Shady, rational, passionate, aggressive, and diplomatic are just a few of the personality traits you can pick up, and people will react accordingly. This makes for some exceptionally deep roleplaying, allowing you to create a character with a nuanced personality that has a direct effect on dialogue and how people perceive you, opening up, and closing off, opportunities. As you explore the Deadfire you'll find stray animals you can adopt, who buff the party when they're following you. On my travels I found Chauncey, a tiny pig with a +1 dexterity boost; Kaz, a Shiba Inu who grants me a +1 bonus to stealth and survival; and Peter, a cat who makes area of effect spells deal 15% more damage. When Serafen joins your crew, he reveals the location of a pirate leader who you have a special interest in killing. He's holed up in a place called Fort Deadlight, and it’s here where one of Deadfire’s best quests takes place. If you’re brave you can fight your way through the fort, but it’s more fun to slip in undetected and blend in with the other pirates. Talking to them reveals clues about your target’s routine, his weaknesses, and suddenly you’re playing a Hitman level. There are numerous ways to kill him, and the sprawling fort is filled with alternate routes, hidden paths, and NPCs. It’s a brilliantly designed quest, but not quite as reactive as I’d have liked. When guards see through your ruse they blow a horn and alert the target, so I thought I’d pickpocket the horn to stop them. But even when I did, they produced one out of nowhere and blew it anyway. That aside, it’s a superb piece of design. Pillars of Eternity II is another fine RPG from Obsidian, brilliantly showcasing the studio's knack for strong world-building, intelligent, expressive writing, and varied quest design. It’s a big, deep, wordy CRPG in the classic mould, but with enough new ideas to feel like more than just a throwback. The sailing is the only thing I didn’t really engage with, feeling somewhat half-baked compared to the rest of the game. But if it’s a fantasy RPG filled with pages of brilliant, descriptive dialogue you’re after, and a huge, open world to explore, the Deadfire Archipelago delivers all that and then some. We’re more spoiled for choice when it comes to RPGs like this than we were in 2015, which makes Deadfire feel a little less special than the first Pillars. But that’s a minor gripe in light of the fact that this is another great game from one of the best studios in the business, offering many hours of quality roleplaying.